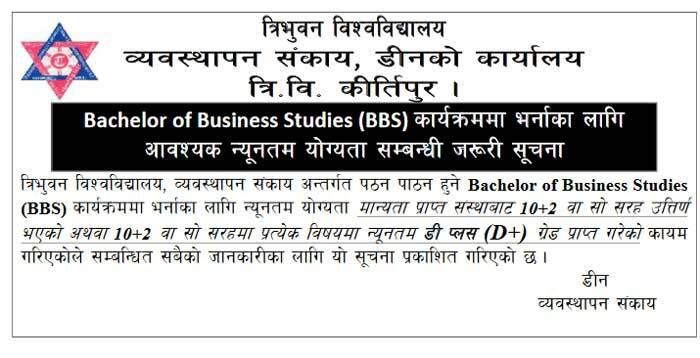 Tribhuvan University Faculty of Management Office of the Dean has published a notice regarding BBS eligibility 2018. > must have successfully completed the PCL or 10+2 in business/commerce or an equivalent course from a Higher Secondary School Board, or from Tribhuvan University, or from any other University/Board recognized by TU. 1. Equip the students with the required conceptual knowledge of business and administration to develop a general management perspective in them. 2. Develop required attitudes, abilities and practical skill in students, which constitute a foundation for their growth into competent and responsible business managers. 3. Encourage entrepreneurial capabilities in students to make them effective change agents in the Nepalese society. 4. Develop necessary foundation for higher studies in management and thereafter take up careers in teaching, research and consultancy.